Monolith M1060 headphone is a perfect sounding planar magnetic over-ear headphone. The best part about the headphone is the drivers. With large drivers, the sound quality resonates and is quite clear. The headphone has open back design and that makes the headphone a tad stylish if you compare it with other models in this range. Monolith M1060 planar headphone can give you a complete audiophile experience. The headphone provides a holographic listening experience and that makes it quite popular in its league. The headphone offers a fuller sound quality because magnetic reach and frequency are great. Music lovers rely on par performance and great sound quality. You can get both the things with this awesome headphone. Its complete value for money as it does what it says. Most people complain about connectivity problems with open design and over ear headphones. This is not the case with Monolith M1060 headphone. Along with exceptional sound quality, the connectivity of the headphone is also great. The headphone has a low power requirement and that is an added feature of the headphone. If in-depth music sounds and audio quality matter to you, then Monolith M1060 headphone is certainly for you. It’s not only perfect for your music listening but also for your studio needs. As the connectivity of the headphone is great, your experience with the headphone will also be good. You can also use the headphone for gaming. The sound is clear and this only enhances your music experience. With its multifunctional benefits, the headphone is perfect for you. The planar drivers in the headphone give you perfect sound every time you use the headphone. If comfort matters to you, then Monolith M1060 headphone should be your choice. Most headphones are not that great in comfort because of the ear cup designs. But, this headphone scores big in comfort too. You can buy it for the super comfort it offers, as the ear cup designs are soft and big. If you need you to listen to your playlist for hours, there will not be an issue. In fact, it is designed in such a way that you won’t feel any kind of pressure or any kind of discomfort even if you wear it for long hours. The performance of the headphone is simply great and you can buy it for all the amazing features it offers. There are many great features of Monolith M1060; let us look at some of the key features. The Monolith M1060 planar headphone features a 106mm planar driver technology that resonates an exhaustive aural landscape and resolves all the sonic details from the finest recordings. The headphone offers stunning imaging, squat distortion, and flawlessly balanced sound to give you a true audiophile listening experience. Monolith M1060 planar headphone has an open-back design to provide a holographic listening experience. The isolated experience may be missing but this sound is good. The Monolith M1060 headphone has been engineered to be comfy for extended listening sessions. The headphone features comfy ear pads made of faux leather. The padded headband is designed to keep you at ease as you listen. The Monolith M1060 is an open-end headphone and that makes it popular as compared to other headphones that are available. The Transducer Type of the headphone is Planar Magnetic. It supports the Neodymium magnet base and that makes a difference in the overall quality of the headphone. The Maximum Power Handling of Monolith M1060 headphone is 10W (for 200ms). The frequency response of the headphone is pretty good at 10Hz ~ 50kHz. The Monolith M1060 headphone does not require any kind of battery. So, you don’t have to worry about charging and replacing the battery of the headphone. The headphone has a Linear Symmetry Magnets magnetic structure and is great in performance. The distortion power of the headphone is also different as compared to other headphones that are available. Monolith M1060 headphone has a total Harmonic Distortion of Less than 1% at 1mW; 1kHz. The open style headphone gives a clear sound and that is the major highlight of this headphone. Sound clarity is not only clear but you can hear the effect of every frequency and base. The headphone requires a low power and that makes it superior as compared to other brands that are available. The connections are good and there is no such problem in connectivity of the headphone. It can be bulky or heavy if you need to use it on a regular basis. Planar Drivers: Not your typical headphone driver! A planar magnetic driver is a flat membrane that is surrounded by magnets. Open Back Design: Instead of an "inside your head" isolated experience that traditional closed-back headphones provide, open-back headphones provide a holographic listening experience. Comfort: The Monolith M1060 has been engineered to be comfortable for extended listening sessions. Large, comfy earpads are designed to keep you comfortable as you listen. In the comfort department, the headphone scores full marks. It’s the first open headphone that is great in comfort and looks both. The headband perfectly stays in the place and there is no clamping at all. The ear cups are soft and comfortable, so there no pressure on your ears even if you listen to music for hours. The only thing that goes against it is its weight. As compared to other models, this is quite heavy in weight but not so bad in fit. Overall, you can wear it for hours without complaining. The fit is ideal for all the head sizes as well. Monolith M1060 planar headphone is simply the best for your music experience. But, it does not have the noise canceling feature. The open back design of the headphone is indeed stylish but it does not really serve the purpose of noise canceling. No doubt, the audio quality of the headphone is awesome, but still, you can hear voices from a different frequency. It also misses on the isolation feature. The headphone uses sound technology like no other, so you don’t have to worry about this feature. It’s still a great choice for your music listening. You can certainly use this headphone while traveling too. The headphone features enormous ear cups and that is the highlight of this headphone. The ear cups are not only great in comfort but it provides an added cushioning to your ears. It’s heavy if you compare it with other headphones that are available in this range. But, its also durable if you need it for your regular use. The extra padded design of the headphone is also good. It’s sturdy and it’s great for the price. The design of the headphone is also stylish. You can indeed flaunt this headphone in style. There is no issue of readjustment or connectivity with the headphone too. Planar headphones are specifically designed for great sound. This headphone is no different and it offers amazing sound quality because of the technology it uses. In fact, you can expect complete wideness and airy sound quality without any kind of discomfort. The bass base of the headphone is quite good. There is no problem with the mid-range and high range too. The frequency of low range, however, depends on the place you are listening to. The best part about the Monolith M1060 planar headphone is that there is no audible distortion of any kind. The performance is not only smooth but also great. The headphone has a wired connectivity so there is no need for a battery. The batteries are not included with Monolith M1060 planar headphone. The headphone does not come with the rechargeable battery too. The connectivity of the headphone is quite good. The headphone gives a great music experience with the sound quality it offers. You can listen to music or play games at a stretch without the need to replace the battery. There are different cords available for your needs. You can choose the best option and use it according to your convenience. It’s quite popular for this feature as well. The sound quality of the headphone is amazing. The price of the headphone is good. It includes all the basic connections. It’s great in comfort and fit. Is heavy compared to other headphones. The look is not too stylish. The carrying case can be better. Monolith M1060 planar headphone is a great sounding headphone and there is no doubt about it. The performance of the headphone is high end and the sound quality is just perfect because of the technology. It’s actually a great buy in this price range as it offers amazing features too. Its truly comfortable and has a great design. Fit wise too its perfect and there is no problem as such. If you compare this headphone with other high-end headphones that are available, then this one is a clear winner. 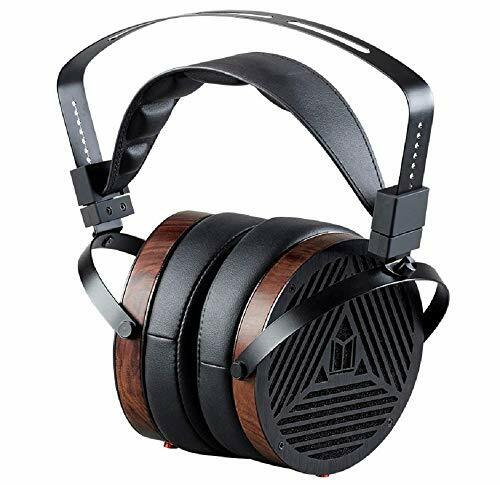 Monolith M1060 planar headphones have made a perfect entry into the world of planar headphones. And, in no time the headphone has indeed become popular. The open ear design of the headphone makes it a great choice as well. It offers excellent value for money at the price range and you must buy this one for pure music experience.